Clear skies and 73 degree weather make for a good day on the river. 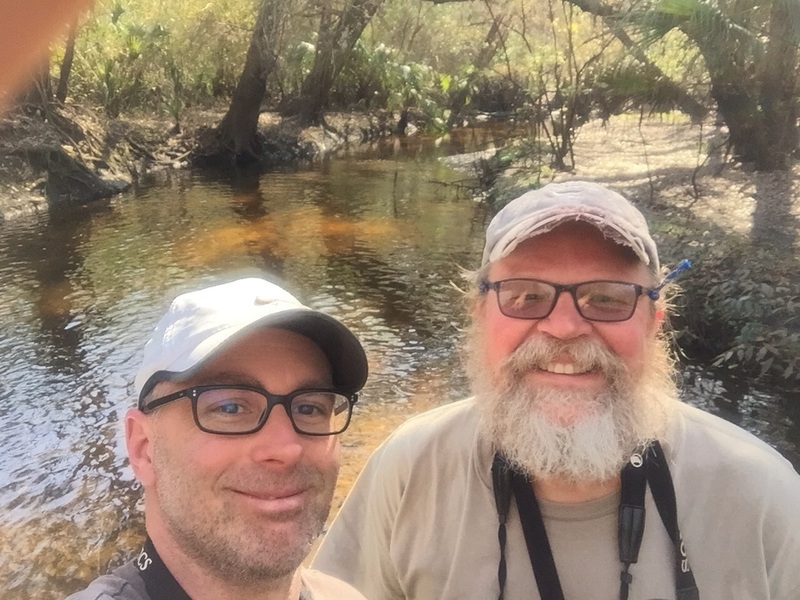 8:45am - George and I are headed to the Little Manatee River to check for the presence of Suwannee cooters. This is the second day of our week long survey of three rivers. We hope to follow up with yesterday's success. Check back throughout the day for updates. 12pm - We just paddled upstream for 2.5 miles and have stopped at a canoe outpost for lunch. Despite a beautiful sunny, 75 degree day we have only seen two peninsula cooters. We will paddle another mile or so upstream before floating back down to the state park where we put in. More turtles should be basking an drifting with the current will be easier for binocular scanning and photographs. 4:30pm - After paddling approximately seven miles we unfortunately we're unable to locate a Suwannee cooter. The weather was perfect and we saw around 15-20 peninsula cooters, both large adults and this year's babies. We are going to paddle another six miles of the river on Friday including a section we did not do today. Turtle nerds in their native habitat. The river is quite scenic although fairly devoid of life. Other than the turtles we only saw a few small killifish, a few tiny warblers, one Belted Kingfisher, and two alligators. Today was frustrating since we did not find the species we were searching for, and we ache from paddling and are slightly sunburned; yet it has been a great day and I feel lucky since my research partner is also my best friend. George and I first met in 1994; I was 21 and he 36 years old. We have been working on numerous projects together for 22 years now. For twelve of those years we have been conducting fieldwork and publishing on the Suwannee cooter. We are just two turtle nerds trying to make a difference one (or six!) projects at a time. Last year's baby peninsula cooter, approximately two inches long.